The cable network spent $3.5 million to buy the house and it is spending a lot of money to restore the interior to match the iconic sitcom. 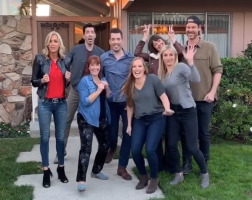 So what will happen after HGTV completes filming of A Very Brady Renovation? Discovery lifestyles chief Kathleen Finch said the house will likely be given away, according to The Hollywood Reporter. At the very least, she says, fans will have the chance to "earn" a stay in the house. Finch emphasized that no definitive plans have been made. Finch, speaking at the NATPE conference in Miami, also revealed how HGTV became a secret bidder for the house, beating Lance Bass' bid. "We went undercover and toured the house," she says. "Turns out we get into a bidding war with Lance Bass. It turned into a TMZ event. It spiraled out of control." HGTV eventually sent a representative to reveal the network's intentions. "We went to the family, said who were and said we'd be really respectful of it."